America's Army Forums • View topic - Map rotation. A new question for your. We have only selected 5 maps, all squad. However, continue to appear in the rotation, maps that we have discarded. Please to do so that only the selected maps appear? Post subject: Re: Map rotation. This means only Inner, Downtown and Three Kings are in rotation. After you changed the ini reboot your server. Sorry, but I dont understand you. Where I have to set those parameters that you refer to me? 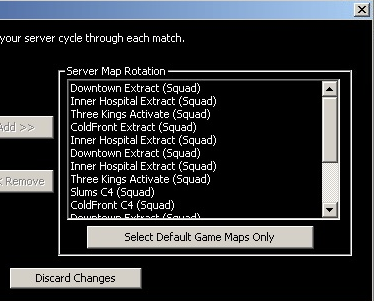 You need to make sure that the server isnt running when you change the maps in the rotation. Then before you re start the server hit save.